I hope you’ve had a fantastic week. Hi everyone! 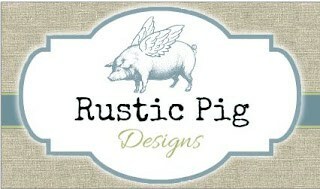 My name is Claire and I blog over at The Rustic Pig. I am so excited to be visiting and sharing my home with you all today! I am especially excited to be hanging out with my sweet friend Suzy!! First of all, we live in the Texas Hill Country, about 30 miles northwest of San Antonio in a little city called Spring Branch… not to be confused with the city in Houston. Right now we are enjoying the fields of wild flowers that recently took the place of the bluebonnets all up and down the highway near our home. I just love spring!! Our home sits on a little over an acre of land. One of the things we really wanted around our home were trees… lots of them! Luckily, we got that, and then some! There are several tall oak trees on the property. Not only do they provide shade during those hot Texas summers, but they are also great for little boys who love to climb trees! The previous owners not only custom built the home, but also custom painted the entire house…. 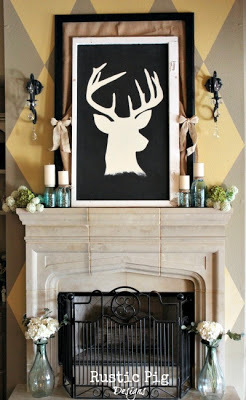 including antiquing all of the trim and hand painting a few special touches here and there. Come on in and I’ll share a few of my favorite rooms in the house. When you come in through the double doors, you enter into the foyer. The majority of the home is covered in walnut wood floors. To the left, is my office and one of my favorite rooms in the house! I recently bought and painted that lovely french desk you see in my office. It will stay with me forever! I LOVE it! You will find lots of antique pieces of furniture in our home… some painted, some not, but using these pieces in an unexpected way is one of my favorite ways to decorate. For example, this old ironing board begged to be used as a table, and it worked out perfect for my husband’s office. To the right of the foyer is the formal dining room. The living room and kitchen are truly the center of our home. Of course, my painted pieces show up here and there throughout the house, like this coffee table, and the black buffet in the back. …I’m sure it will change again when the seasons change. Our french country kitchen is yet another place I love! Again, the entire kitchen (including the cabinets and drawers) was custom painted by the sweet lady who lived in the home before us. She has some amazing talent! Next, our master bedroom. I love the calming colors of this room, but mostly, I love the windows. Not only are there windows all around, but in front of the bed are double doors that lead to our back patio. Finally, our master bathroom. It is the perfect retreat after a long day of painting and blogging. Suzy, thank you so much for having me here today! I feel like such a lucky girl! Thank you, Claire, for letting all of us snoop around your lovely home today. I just want you to know that I am majorly jealous of your kitchen! Pookie knows that is my favorite cabinet finish. Made for a wonderful tour with my coffee. I love your office and kitchen! Thanks for sharing Suzy. Suzy, Thanks for featuring this new-to-me blog and blogger! Claire, you have a beautiful home. Your love of decorating shine through!!!! What a great name for a blog! I’m heading over there right now to be a new follower! Suzy, thanks again! So nice to meet new friends! This was a great snoop and tour!! The house is stunning I love everything. The kichen cabinets are fantastic and love both their offices. So much beauty to look at and enjoy. Have a great weekend! Great tour, thanks for sharing. Love seeing Claire’s home….a great tour today! !…and I so enjoy visiting the San Antonio area…one of my very favorite places to be!